Bristling Badger: Hillsborough: Why The Lie? It's been an extraordinary week at the Hillsborough Inquests. The police officer in charge on the day of the disaster, David Duckenfield, gave evidence for four days. Duckenfield was woefully inexperienced in 1989. With a poorly organised flow of fans arriving, there was a late build up of people outside the ground. Duckenfield ordered an exit gate open to give them access and that, combined with poor signage inside, led to the crush that killed 96 people. Even as the disaster was unfolding, Duckenfield started lying. With their view from the press box down on to the terrace, Graham Kelly of the Football Association asked him what had gone wrong. Duckenfield said fans had forced the exit gate open. In the hours that followed, he did not correct that. In the days after, he was part of the South Yorkshire Police's narrative that drunken, ticketless fans had caused the crush, an assertion that has since been comprehensively disproven. There was a concerted effort to protect Duckenfield and the other senior officers. Officers were told not to write in their official pocketbooks and not to have clear memories before writing notes. Hundreds of police witness statements were altered to remove phrasing critical of the police. When West Midlands Police were brought in to examine the South Yorkshire investigation, they harassed and threatened fans into retracting criticisms of the police. One fan who persisted had an officer question if he'd even been at Hillsborough, saying he could have got his bruised ribs anywhere. All this stood for 24 years until the Hillsborough Independent Panel's report established a clear picture in 2012. There was no drunken mob of ticketless fans - the size of the crowd matched the number of tickets issued. The original inquests' assertion that everyone was dead of traumatic asphyxia by 3.15pm (thus preventing examination of anything that happened after that time) was nonsense. Many fans could have been saved. The Panel's titanic work is not the end of the story. The new inquests are part of the ongoing process of uncovering the truth. To the surprise of many, this week David Duckenfield gave an unreserved apology to the families of those who died. Michael Mansfield QC, representing 75 families whose relatives were killed, asked why he had remained silent for 26 years. Duckenfield said that he had been prompted to finally tell the whole truth after the publication of the report by the Hillsborough Independent Panel in 2012 and a television programme he had seen about the disaster’s effect on the families. 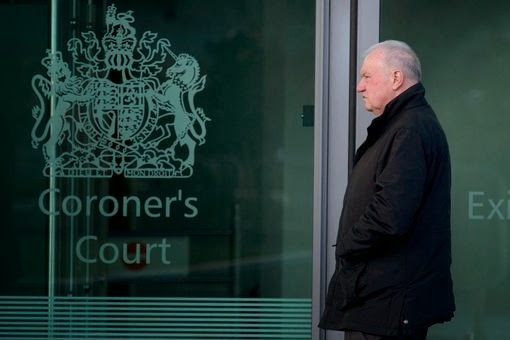 He said he had post traumatic stress disorder, and “hid myself away and could not bear the word Hillsborough” after the report was published, but then said he had begun to face the truth two years ago, with the help of doctors. Whilst we must reserve our strongest sympathy for the victims and their families, whose pain has been prolonged by Duckenfield's silence, nonetheless it's obvious that anyone in his position would be highly traumatised and cannot be blamed for the impulse to hide from their actions. But if he accepts responsibility he lays himself open to prosecution. So even now, after his appeal for sympathy and declaration that he's ready to tell the truth, he is avoiding basic admissions. Coroner Sir John Goldring asked: “You are saying, are you, that a reasonably competent match commander would have foreseen where fans should go? From this bald admission Rajiv Menon, lawyer for 75 families, tried to get an admission of gross negligence. Duckenfield, aware of his legal position, prefers trivialising terms for the 96 deaths that he is primarily responsible for. Sir, my view is, it was an oversight, a mistake. I don't view it as negligence, and certainly never gross negligence. He went on to explain that fans were partly to blame for their own deaths. What evidence does he have? I cannot say from first hand evidence that drunken and ticketless fans attended at the stadium. What I can say is I have heard various stories and I have picked up things as things have gone along, but my first hand experience is, I did not see any drunken ticketless fans... I hold the view that football fans played a part. This unquoted, unattributed, unspecified assertion of stories and 'picked up things' is apparently enough to convince him that he's not to blame. It is a slap in the face for the people to whom he has said he will speak frankly and honestly. He still can't tell the truth. We all say wrong things in moments of panic. But that's not what Duckenfield did. He lied, then he repeated the lie. After lying to Kelly, Duckenfield acknowledged he went to the boardroom at Hillsborough, where Tony Ensor, Liverpool football club’s solicitor at the time, has testified Duckenfield told him and others that Liverpool fans “forced open a gate”. Duckenfield said he could not recall saying that, but agreed with [counsel to the inquests Christina] Lambert that he missed a “golden opportunity” at that meeting to correct the lie he had told Kelly. He said it was “a terrible fall from the standards that one would expect”. But instead of any climb back up to decent standards, he chose to accelerate the fall. He actively, persistently wove the lie into a narrative that blamed his victims. I’m an honest person, I don’t lie, I set high standards. Nobody can understand my behaviour least of all me. Many of us really can understand his behaviour. The more power we hold, the more we have to lose. The first job of authorised power is to protect its position. There are few places that illustrate it more starkly than the police. Even without Duckenfield's distraction from honesty and civic duty due to his personal position and loyalties (he was promoted to the masonic position of Worshipful Master the year after Hillsborough), this deflection of blame is second nature to police. We see it in routinely colluded statements that all give the same false story of an event, that exaggerate the threats they face. Ian Tomlinson was killed by a police baton strike whilst standing in as unthreatening a position as humanly possible, yet the immediate police story was a complete lie claiming he had a heart attack whilst brave bobbies tried to save him under a hail of bricks and bottles. Even after the footage came out showing the lethal attack, police refused to admit responsibility or even basic facts. The officer leading the investigation, Detective Superintendent Anthony Crampton, suggested to Tomlinson's family that the assailant was an anti-capitalist protester in a stolen police uniform. The Independent Police Complaints Commission said the idea was credible. Imagine the gall, the overconfidence and the level of personal denial it takes to do that. Imagine how marrow-deep they must be. This isn't a family liaison numpty saying something off the top of their head. This is a high ranking officer with machinery and accomplices around him to fortify the lies that armour his - and, by extension, the police's - near-impregnable power. It's exactly the same as Duckenfield and the officers of all ranks who collaborated in the lies, intimidation and destruction of evidence that formed the Hillsborough cover-up. This is the inevitable result of a default tendency in the power of authority. Until that is consciously understood and addressed, automatic lies will continue.